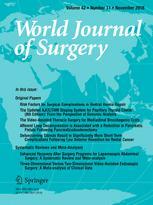 Do Nano-crystalline Silver-Coated Hernia Grafts Reduce Infection? Splenic Cysts: A Strong Indication for a Minimally Invasive Partial Splenectomy. Could the Splenic Hilar Vasculature Type Hold a Defining Role?